There's a saying that "It takes a village to raise a child" — that a child is the product of the entire community in which she was raised. Something similar is true of car racing (and especially endurance racing). What wins races isn't a driver, or a car, or a mechanic, or a designer. It's a team that manages to effectively combine those aspects plus a variety of others. It's a group of folks who know how to work together to make the most of the pieces at their disposal. But the village in this case is more than the team; it's the community that supports the team and enables it to flourish. The community is what enables the team to execute consistently. So while there are certainly mechanical and technological aspects to racing — you can't win consistently without a great car — there's also a significant human aspect — you also can't win consistently without a great team and a supportive community. Many of the steps that go into winning a race happen before the car even makes it onto a racetrack. There are months or years of development (engine, suspension, chassis, aero, cooling, etc. ), along with significant amounts of tuning and refinement. Much like a growing child, a race car carries forward the fingerprints of all the people who helped it reach the point of maturity, regardless how slight the influence. Then there's tuning and race prep that happens once the car actually gets to a track, starting at least a few days before each race. 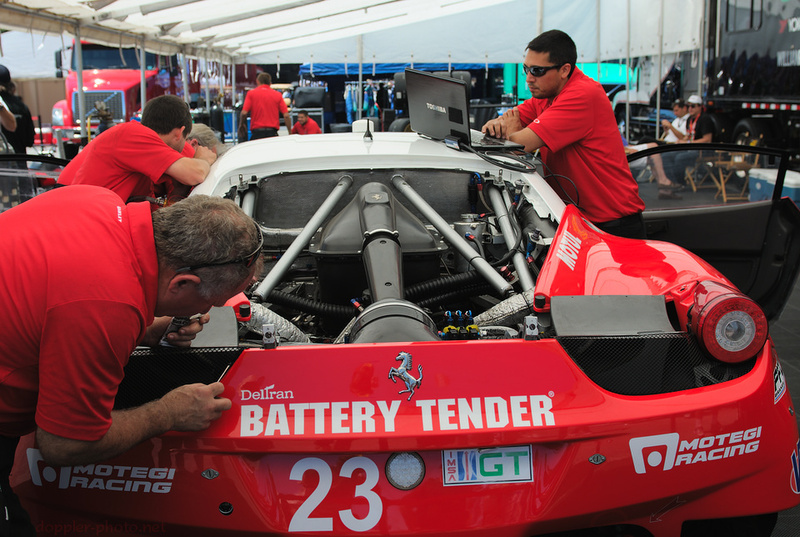 The goal of that process is to tailor the car to the specific requirements of that race. For instance, a bumpy track might favor a softer suspension. A particularly high ambient temperature might require a less-aggressive engine tuning. A car with less downforce might do better on a track with lots of high-speed sections and sweeping corners. Above, team members of the #23 Team West/Alex Job Racing Ferrari F458 Italia perform some last-minute race prep a half-hour before reporting to the Laguna Seca track entrance. And then once the race starts, it's up to a different team (though often with overlapping individuals) to actually keep the car running well and racing well. How long can the car last between fuel stops? Can the driver hold off an oncoming competitor without using too much fuel or putting too much wear on the tires? Should the car carry more fuel, or carry less fuel (less weight) and plan on more pit stops? A race team includes people who plan the race strategy, and others (including the drivers) who execute that strategy. 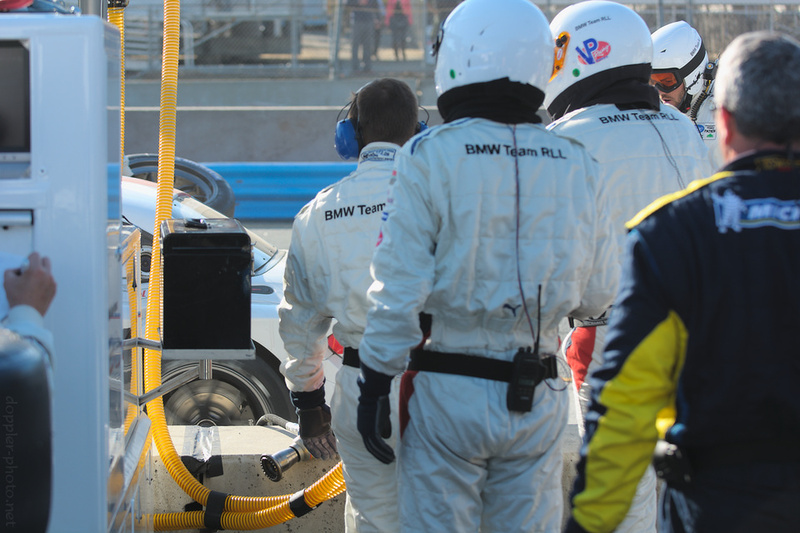 In the photo, the #56 Team RLL BMW Z4 GTE pit crew watches as the driver takes off after a tire/fuel stop. Of course, a team is more than a set of individuals who can work well together. At times it's a support structure, a group of people who can share the burden when things go poorly, and who can help keep you motivated when there are tough roads ahead. And often the community itself forms part of that support structure — they celebrate with you in times of joy, and they endure (and sometimes grieve) with you during times of hardship. 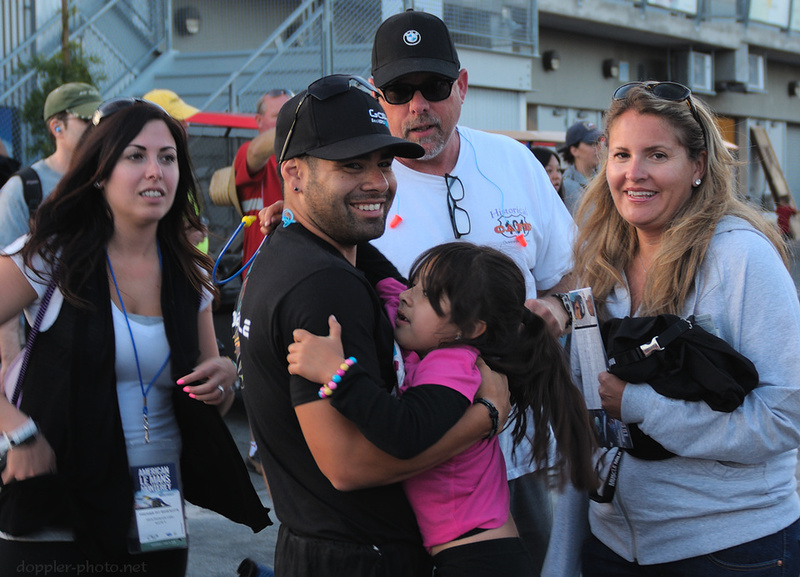 Above, a member of the Muscle Milk Pickett Racing team greets family and friends after the team's #6 HPD ARX-03a car finished in the overall lead after four hours of racing. Then there are the fans. While they do help to finance the teams, venues, and events; they are, most importantly, advocates of motorsport to people who aren't yet part of the motorsport community. They spread the love of the sport, and they can help cultivate a friend's passing interest into a lifelong passion. 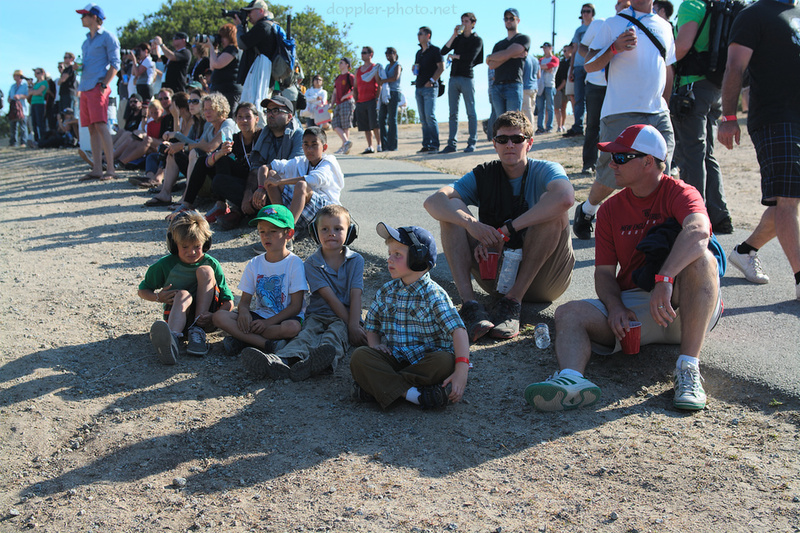 Above, fans watch the race from near the Corkscrew, which is the iconic segment of the Laguna Seca racetrack, and, really, one of the most well-known sections of any racetrack, anywhere in the world. Which brings us to heritage. 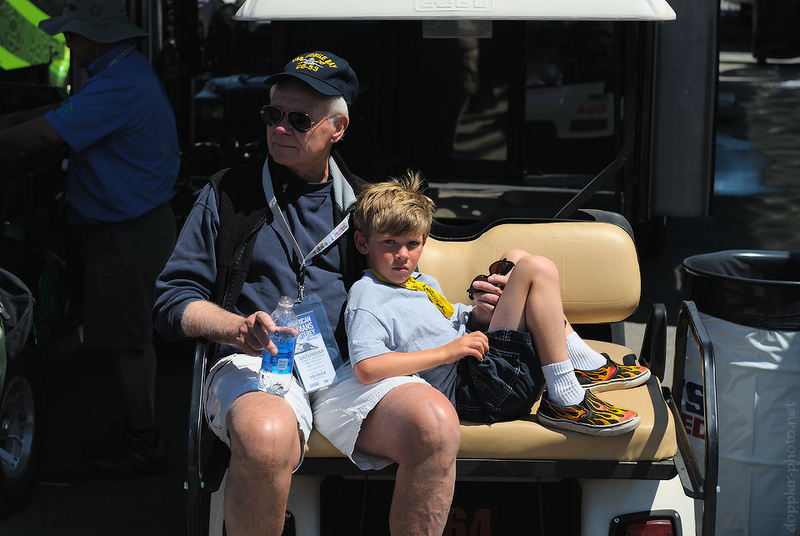 Just like that child who grows up to help guide the next generation, the "village" of motorsports is also self-sustaining: the teams are points of interest that draw newcomers into the motorsports community, and when the teams need new members, they draw from that same community of impassioned friends, fans, and family. Maybe it's someone who has accomplishments under her belt, but is looking for the next step. Or maybe it's someone who's watched races every weekend, but is finally getting his own chance in the sun. Whatever the case, the village helps to keep each team racing toward the horizon. If you like these blog posts, please become my supporter on Patreon to help me keep them going! Your support really makes a big difference for me. As a particular example, this single post took me over a week to write, edit, and post, and without the support of people who have already made a pledge, it simply might not have happened. None of these pictures or words would see the light of day. So again, if you enjoyed this content, and if you'd like to see more posts like it, please click here to support my work. Every dollar makes a difference.